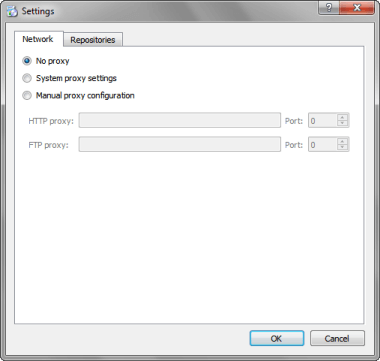 Settings pages enable end users to specify proxy settings or install add-on components. End users select Settings on the introduction page to specify the settings. By default, the installer uses system proxy settings. End users can select to use no proxy or specify the proxy settings manually. To install add-on components, end users select the Repositories tab. If the web server requires authentication, end users can add their username and password. To display passwords, end users select Show Passwords. To add their own repositories to the installer, end users can select Add and specify the URL that points to the repository. 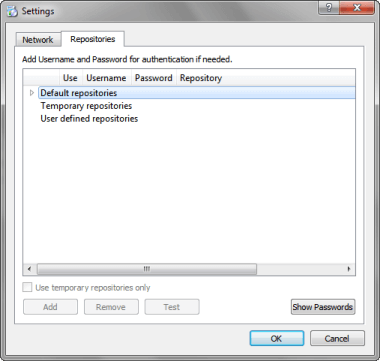 Temporary repositories can be used only once, for initial installation. After the installation, only default and user-defined repositories will be available.